Report on the 23rd round ISP NSW match between Newtown and Mounties, played at Aubrey Keech Reserve on Saturday, 13th August 2016 by Glen ‘Bumper’ Dwyer. 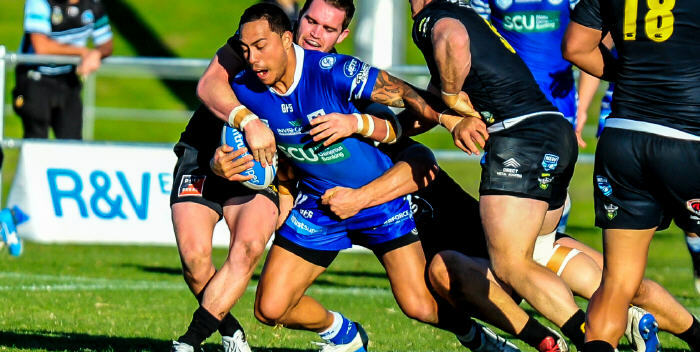 The Newtown Jets had the incentive of possibly moving into the competition’s top four when they played the Intrust Super Premiership frontrunners Mounties last Saturday. The Mounties were in turn motivated by the chance to lock in the 2016 minor premiership title. The Jets turned on what was described as “their best first thirty-nine minutes of the season” when they ran up a 16-0 lead, only to concede a converted try in the final seconds of the first half. Newtown winger Jacob Gagan, back-rower Anthony Moraitis and Samoan international halfback Fa’amanu Brown had scored Newtown’s tries, with in-form second-rower Kurt Capewell landing two conversions. The Jets marred their strong first half performance by kicking out on the full, giving away a penalty and then having Mounties score from a kick into Newtown’s in-goal right on half-time. Newtown had the better of the third quarter with Capewell adding a penalty goal, followed by Moraitis scoring his second try. Capewell’s conversion from the sideline gave the Jets a 24-6 lead in the 53rd minute. The momentum of the game clearly swung when Mounties scored from an intercept five minutes later, followed up by two more converted tries in quick succession later in the second half. With the scores tied at 24-all, the Jets mounted a last-ditch attack with two minutes left, and after some scrambling play Gagan scored his second try. Newtown then failed to close the game down effectively in the last moments and they paid a devastating price. Mounties gained possession and scored a ninety-metre try which was converted, giving the Canberra Raiders partnership club a last gasp 30-28 win. The Mounties are certainly the great escape artists of the competition, having overhauled a 28-6 points deficit against Wests Tigers two rounds ago. Jets coach Greg Matterson no doubt felt the pain of this loss as much as anyone, and he said there were important lessons in game management to be learned from this defeat. The Newtown players needed to deploy a better kick/chase game, and to learn how to lock down a result effectively. This was an important two points that had been snatched away from the Jets, and the team’s younger players could learn from the gut-wrenching experience. Matterson praised all of the Newtown forwards, saying they had played tough and had the better of the opposition’s much-vaunted forward pack. He also mentioned young centre Lachlan Stein who continues to impress in this senior grade. Cronulla Sharks Holden Cup centre Keenan Yorston made his senior rugby league debut with Newtown on Saturday and will be much improved from undergoing this baptism of fire. The Jets return to Henson Park this Saturday, 20th August, to play the North Sydney Bears in the second and deciding leg of the annual Frank Hyde Shield series. This match is always one of the highlights of the Henson Park calendar and is timed for a 3.00pm kick-off. Newtown has to win to stay in contention for a top four finish, while the Bears are embroiled in a four-way struggle for the last two places in the top eight.